Simulator (SANDRA) » DST – Entwicklungszentrum für Schiffstechnik und Transportsysteme e.V. 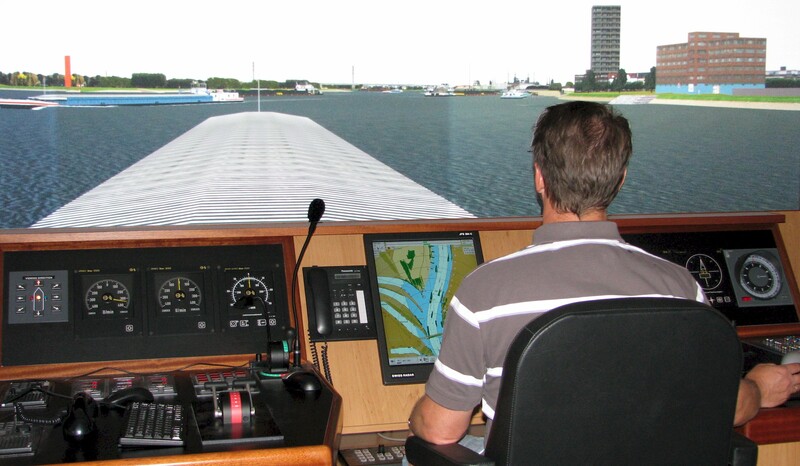 Learning, practicing and analysing – the list of possible applications of modern simulation technology is long and is not limited to the well-known flight simulators, but for many years also includes the sector of inland waterways. The simulator SANDRA (Simulator for Advanced Navigation Duisburg – Research and Application) is a modern simulator, which always keeps pace with the state of the art in science and technology. The modeling of the movement behavior includes all relevant factors such as shallow water and wall effects, interaction between ships as well as wind and current. Special analyses like navigation studies for envisaged infrastructure measures, risk assessments or investigations of accidents. The high quality of hard- and software as well as the highly-skilled staff ensure the highest technical and nautical levels for all activities carried out by the simulator. To meet the various challenges, the DST develops or modifies – as required – electronic charts, 3-D visualizations of ship types. environmental conditions (day/night, current, weather conditions, water depth). 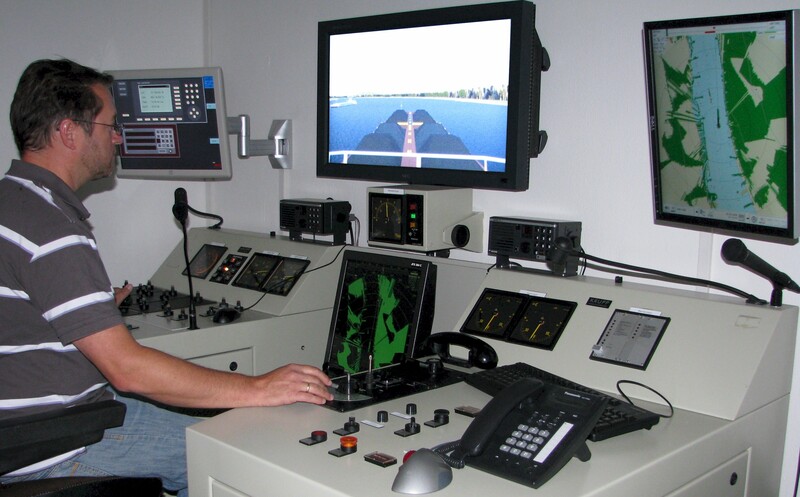 Within the framework of vocational training, nautical basics are taught under realistic conditions on the simulator. These include the use of nautical aids such as VHF system, radar and ECDIS (Electronic Chart Display and Information System). 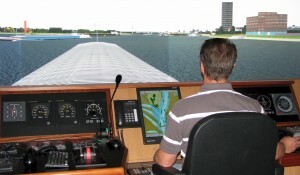 As there are often no possibilities for ship’s boys (apprentices for boatsmen) to acquire driving skills on board, the simulator familiarizes them with the basic movement behaviour of an inland vessel. 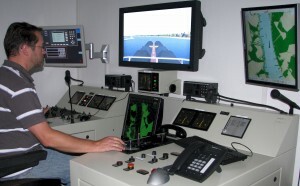 At the end of the training, the hardware of the simulator is also used for the final exam. The training opportunities are in the hands of experienced instructors. In addition to standard courses, to prepare for patent examinations, individual training content can be agreed on. Such special courses, for example, are used to train the behaviour in critical situations or to make skippers familiar with new ships or ship components. The training can however pursue other aims, for example, exercising an economic navigation. All trainings benefit from the high density of events, which allows an effective and risk-free learning. Training success is fur­ther aided by exercises being recorded, then replayed and subsequently discussed. 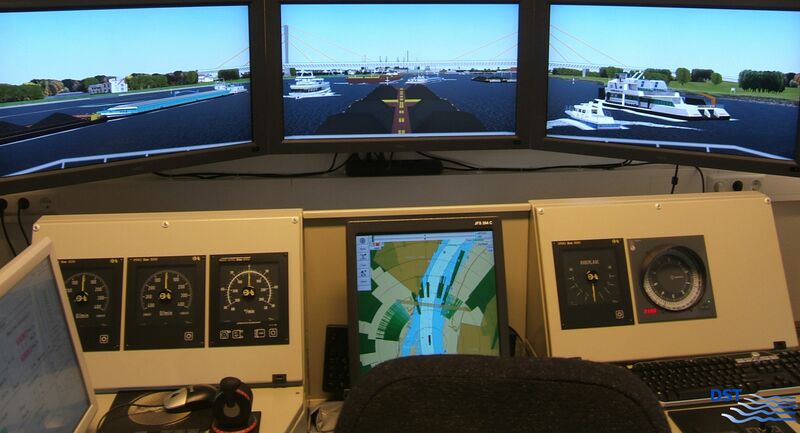 Since ships and operating areas can be modeled as required, it is possible to test the navigability of rivers, canals, ports or canal bridges already in the design or planning stage on the simulator. Consequently, it can be checked for example, before the start of construction, whether under normal ship operation the foreseen water area allows for safe inland navigation traffic. For a number of tasks systematic variations of certain variables such as vessel length or flow rate are required. This applies for example to the determination of restrictions related to a safe control of a ship. But also investigations into stress and fatigue of crew members in different traffic and environmental situations can be mentioned here. Even for such tasks opens the simulator new perspectives in processing. SANDRA, the shallow-water navigation simulator, was spe­cifically designed to enable basic and advanced training of boatmasters and the development of shallow-water related projects. The unit, which is set up in the rooms of the Vocational College for Inland Navigators, comprises 5 bridges for individual or interactive use. In addition, all trainee stations are configured to permit on-sight and/or radar-guided operation and the replication of nautical activities such as signalling and light scenarios as well as radio communication. 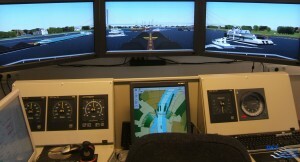 The centerpiece of the simulator is a fully equipped ship’s bridge plus steering system. The high-resolution, forward-heading, 210° visual system is supplemented by three additional monitor screens for aft sight. The modular operating console can be used for both inland and maritime operation. Furthermore, there are four additional training cubicles that are mainly designed for radar operation. However, monitors providing a 40° field of vision also permit on-sight operation. In addition, there is the DST’s devel¬opment station, which includes a test console and a high-performance computer cluster with 240 processors for online calculations. 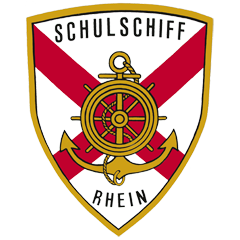 The simulator has a large inventory of ship types, which covers almost all ship types operating on the Rhine, its tributaries and canals. Depending on the individual requirements of the customers this dataset is updated.